I haven’t done an HDR image in a little while, so I pulled out some brackets from our last trip to Jerome. This is the old Assay Office from the Gold King Mine ghost town in Jerome. When I took the shot, it was almost high noon, and the lighting situation was getting pretty harsh. I took a series of five brackets, and needed all five of them to get all the detail in this shot. The items on the desk in the foreground were sitting in a patch of bright sunlight, while the back of the little office was almost completely shaded. For situations like this, HDR rocks! HDR created from five bracketed photos (-2.0 thru +2.0) processed in Photomatix v4. Post-processing in Topaz Adjust / DeNoise with Paintshop Photo Pro X3. I really intended to get out and do some shooting this weekend, but somehow time has slipped away (again). The weather is starting to warm up now here in the Valley of the Sun, and it’s so much easier to just sleep late in the air-conditioned house than to get up early enough to get some quality camera time. However, we’re looking forward to our trip to Vancouver the first week in July for our 20th anniversary, and I’m planning to fill up every memory card I have with images from the Pacific Northwest. Can’t wait! 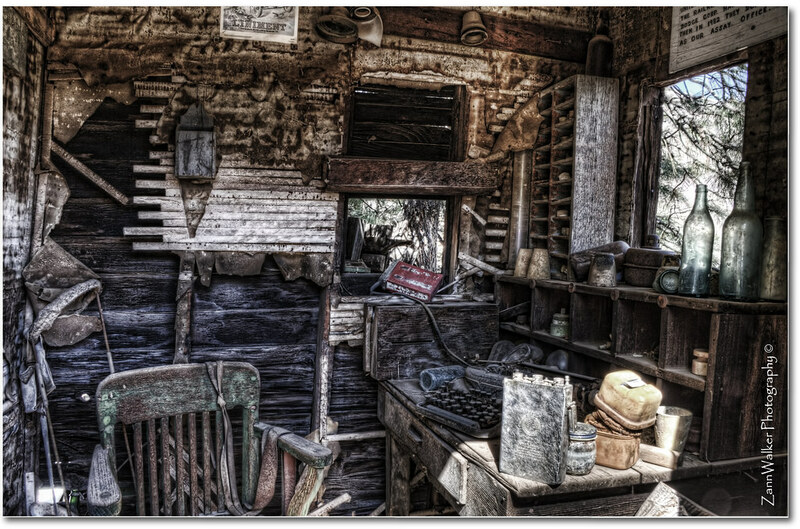 This entry was posted in Processing, Shooting and tagged 28-300mm, abandoned, Arizona, assay office, AZ, building, camera, D700, ghost town, Gold King Mine, HDR, Jerome, Nikon, Paint Shop Pro, photography, Photomatix, software, Topaz. Bookmark the permalink. great photo ! i love old places….everytime you look at it, you discover something new…. Nice grit and detail here!